This application note is to briefly describe the malting process and how Eurotherm controllers may be used to achieve accurate temperature control. Often two temperature controllers are used for germination and kilning but, by careful design of the system, it is possible to use a single dual loop controller for both parts of the process thus minimising the number of installed units, as well as reducing cubicle sizes and costs. The nanodac dual loop recorder/controller, when fitted with the programmer function block is ideal for this application. Other suitable controllers are the Eurotherm 3500 series or 26/2700 series fitted with dual control loops. 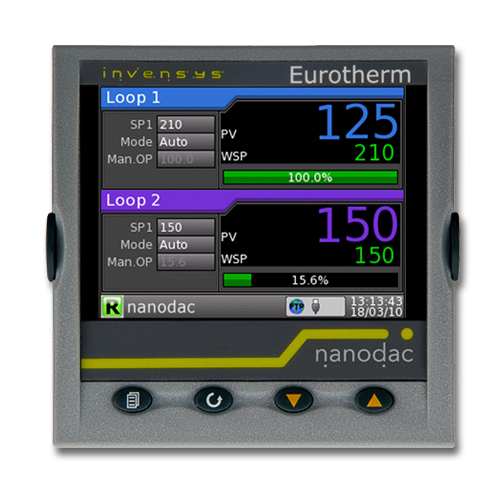 All of the above controllers have dual loop capability but the nanodac recorder/controller also provides additional recording and logging channels in a single ¼ DIN package. The two control loops can be configured to control motorised valves. The loops can operate in ‘Unbounded’ mode (VPU) or ‘Bounded’ mode (VPB). Unbounded mode does not require a position feedback potentiometer, although one can be fitted if required to show the actual position of the valve, see Application Note HA030908U005. Unbounded mode controls directly the direction and velocity of the movement of the valve in order to minimise the error between the setpoint and the process variable. Control is performed by delivering a ‘raise’ or ‘lower’ pulse to control the velocity of the valve in response to the control demand signal. Relays are used to provide raise and lower drives to the valve motors. Bounded control (VPB) uses PID (or any combination of the three terms) to set a required valve position. A feedback potentiometer must be used to provide the signal to measure the actual valve position. This allows the control loop to calculate the difference between the required and actual position dynamically, and adjust the control output accordingly. Control is performed by delivering a ‘raise’ or ‘lower’ pulse via relays. The objective of the malting process is to convert a hard uncrushable grain with little taste (barley) into a friable product (malt) that has sufficient biological enzymes to convert the starchy endosperm to simple sugars, so that these sugars can be converted into alcohol by the addition of brewing/distilling yeasts. The malting process is split into three stages – steeping, germination and kilning. Steeping is when the barley is placed in a box and covered with water to absorb moisture and stimulate the plant embryo (germ) inside the grain to develop. Germination is where temperature controlled humidified air is blown through the germination bed to minimise moisture loss and prevent the barley from drying out whilst the germ is growing. In kilning the germinated barley is gently heated with dry air to evaporate the moisture content down to around 3%RH. At this low moisture level the malt can be kept indefinitely and will not deteriorate in condition. Temperature control is required during the germination and kilning stages. No temperature control is required during the steeping process. Heating is usually by gas or oil and smooth control is, therefore, achieved by controlling a motorised valve. By the use of suitable instruments it is possible to minimise operator intervention, therefore, freeing up labour for other tasks. Existing installations have shown that the kilning process time can be greatly reduced providing significant energy savings. In germination both the temperature of the air blown onto the barley and the air taken off the barley are controlled. These temperatures are referred to as ‘Air On’ and ‘Air Off’. The dual loop controller is used to control both the ‘Air On’ and ‘Air Off’ temperatures. ‘Air On’ is measured by a Pt100 probe and is controlled by modulating cold air louvres. The target temperature is normally around 15°C. When the temperature is too high, cold air louvres open to blow cold air through the barley; when it is too hot the air is recycled to raise the temperature. As the process is slightly exothermic the ‘Air Off’ will be warmer then the ‘Air On’. To prevent overheating, as this would kill the germ, the ‘Air Off’ is controlled by means of a variable speed fan which responds to temperature changes measured by the ‘Air Off’ Pt100 probe. The ‘Air Off’ temperature is controlled at around 17°C . Germination usually takes about 5 to 6 days. In kilning the temperature of the ‘Air On’ is controlled by allowing fresh air to pass over a heat exchanger. Kilning starts at around 60°C. It is then generally increased in a series of steps and dwells and finishes at around 75°C. ‘Air Off’ is not normallycontrolled, but the second loop of the controller can be used to provide advanced kilning techniques as described below. During the kilning process it is important not to force the malt to dry too quickly as this will result in poor quality. Normal kilning processes, therefore, tend to have longer dwell periods than are actually required. However, since the ‘Air Off’ is measured by the dual loop controller it is possible to design a control system which automates the process and reduces kilning times. This can be achieved by controlling the ‘Air On’ using a ramp/dwell programmer. The ‘Air Off’ provides alarm trigger points. When an alarm level is reached it is used to advance the program to the next segment in the program. For example, if a segment is dwelling at 65°C and the alarm trigger point is set to 45°C, then the programmer will advance to the next segment when the ‘Air Off’ is equal to 45°C. In this example Loop 1 controls the ‘Air On’ temperature using the programmer function block to increase the temperature in a series of steps. Loop 2 measures the ‘Air Off’ temperature and is used to advance the programmer to the next segment when the ‘Air Off’ temperature has reached the required setpoint. The alarm output is connected to the ‘Advance Segment’ input of the programmer function block. If more than one alarm is required these may be wired via a logic OR gate to the ‘Advance Segment’ input. This diagram is intended for guidance only and does not necessarily represent a complete control system.